I have a gigantic sweet tooth. And I also love frozen snacks. I've mentioned before how much I love all things ice cream. In recent years, this ice cream infatuation has become a bit of a problem. You see, now that I am an adult woman, I want to keep some sort of figure. And if you are eating some sort of ice cream, fro-yo, popsicle, etc. every night it is a little hard to do that. Now for the record, there was absolutely no way I am giving up my nightly frozen treat. We can only sacrifice so much in the name of fitness and health. 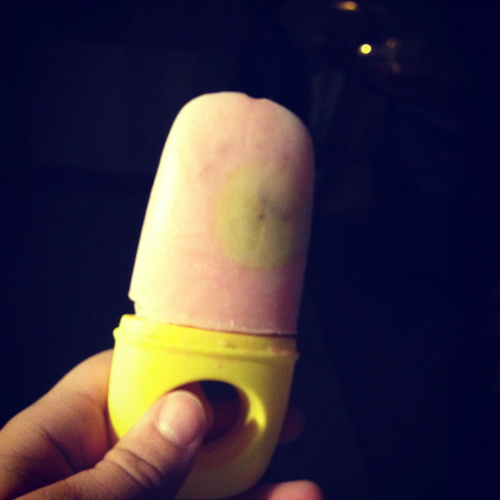 I have been seeing popsicle molds around the blogosphere lately, and immediately knew that that was something I needed in my life. So I went to Walmart and found these babies on sale for $4. I was pretty tempted to fill them with chocolate pudding...but that would have defeated the purpose of trying to be healthy. So I got a tub of fat-free strawberry yogurt and some bananas instead. 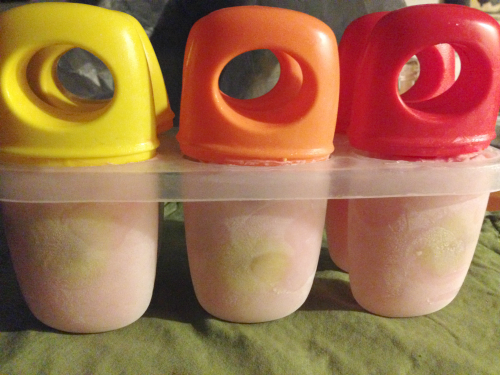 There is one banana slice in each popsicle mold, and when I do these next time, I would cut the pieces smaller. Also, they need a good long time to freeze so that the sticks will hold. Don't try to make and eat these the same day, because you will just end up pulling all the pop handles out of the yogurt. Delicious. And last night I ate two before I went to bed, and didn't even feel bad about it. Do you have a sweet tooth? How do you manage it? Two of my favs together a must try!